Every child’s magical dream will once again come true with glitter, paint, watercolour and crayon in this years’ exhibition of HELLO! I am—I Can Fly 2013. The Connoisseur Concerto, in partnership with the Singapore Tyler Print Institute (STPI), brings in another creative endeavour aimed at engaging young talents. This year, it will be through the art of printmaking. More than 80 young talents, ages 7 to 16, were given the opportunity to create their own works of art. With the theme “I Can Fly”, the young talents participated in special art workshops conducted at STPI. Through the use of silkscreens and special stencils, the children launched their artistic visions on paper. Every artwork is placed in a frame and costs S$199. 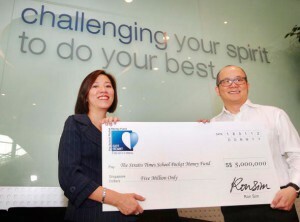 Proceeds of the exhibition will benefit The Straits Times School Pocket Money Fund. The Straits Times School Pocket Money Fund is aimed at providing children with allowance to attend school, especially those coming from families with low income. This community project was initiated by The Strait Times in 2000. Beneficiaries of this project receive S$55 (for primary school student) and S$90 (for a secondary school student) per month. Aside from food, this pocket money can be used by the students to pay for books, stationery and bus fares. Students eligible for SPMF should meet the following criteria. First, the student must be a Singapore Citizen or Permanent Resident. Second, he or she must be a full-time student at a mainstream school, a special education school or religious school, Mountbatten Vocational School, Assumption Pathway School and Northlight School. Third, he or she must be staying in a 4-room HDB flat or even smaller, and fourth, per capita household net income must be S$450 a month or less.